Milk and dairy products will serve as a critical, sustainable food source for the world’s 9 billion people by 2050, said former UN Secretary-General Ban Ki Moon. Mr Ban said he is heartened to note that the dairy industry is committed to sustainably providing nutritious dairy products to 9 billion people as the population grows, while also making efforts to preserve the environment. He cited the Dairy Declaration of Rotterdam, a joint initiative of the International Dairy Federation and the UN Food and Agriculture Organization launched in October 2016 to promote dairy sustainability through responsible consumption and production. 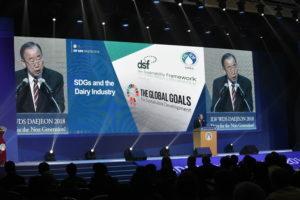 Mr Ban said the dairy sector plays a leading role in international efforts to achieve the Sustainable Development Goals (SDGs) which are aimed at socio-economic transformation to eradicate poverty and hunger, and to construct a sustainable world where humanity can enjoy better education, healthcare, and equality. The SDGs were launched in 2015 during Mr Ban’s tenure at the UN and sustainability remains a key passion of his. He serves as Co-Chair of the Ban Ki-Moon Centre for Global Citizens in Vienna established in January 2018 within the framework of the Sustainable Development Goals to empower women and youth. Mr Ban pointed out that the dairy sector plays an important role in helping to achieve many of the SDGs covering poverty eradication, banishment of hunger, good health and wellbeing and gender equality. Mr Ban said the dairy sector creates employment through its value chain, generating the third-largest output and the largest trade volume among all agricultural industries. 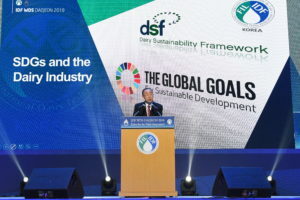 At the same time, he acknowledged that the dairy sector is promoting environmental protection by implementing initiatives to reduce global carbon and water footprints by striving to minimize greenhouse gas emissions, and water and soil pollution generated during the production and distribution of dairy products. Mr Ban urged the dairy community to collectively prepare for the next century by strengthening sustainability for the next generation. He called on the dairy sector to continue to strive through collective efforts to achieve the SDGs. “I hope the accomplishment of these goals can help construct a better environment for your industry to further prosper. I hope you can forge a robust global partnership that goes beyond the boundaries between countries, continents, and regions, and that you can work together to drive the development of humanity and society as global citizens.